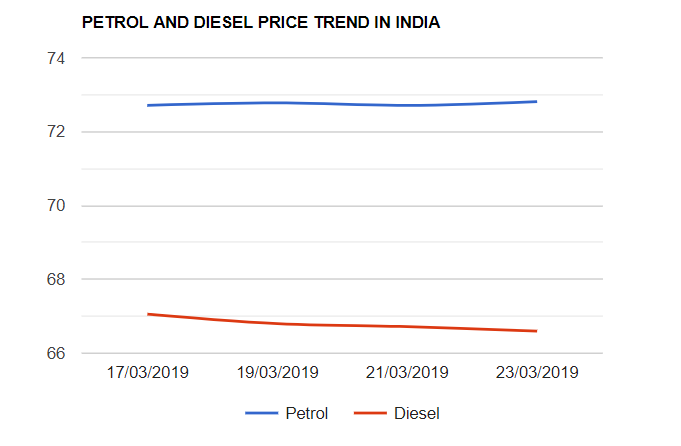 By Srinivas Chowdary Sunkara // petrobazaar // 23rd March, 2019. Today, Petrol prices are increased by 5 paise or 0.1% and diesel prices are down by 5 paise or 0.08% in Delhi. Petrol is being sold at Rs.72.81 while diesel is priced at Rs.66.6 a liter in the capital city of India. Petrol prices were largely moved upwards during the week while diesel prices continued to decrease through out the week. Under the dynamic pricing policy, The retail fuel prices in the country are arrived on 15 day average of global crude prices along with the rupee-US dollar exchange rate. As per the latest publication, The depot price of MS and HSD were arrived at Rs.35.65 and Rs.40.94 per litre which will be added with ED, VAT and dealer commission coming to Rs.72.63 and Rs.67.15 per ltr respectively. Both the motor fuel prices are likely to be little volatile following the global oil market trend.